"I first became of aware of the controversial seeress and prophetess Hildegard von Bingen a few years back and was fascinated and further explored her life. Critisized by many as nothing more than a mentally and physically tortured soul who suffered from hallucinations and hailed by many as a medieval saint whose visions, life and writings were inspired by divine intervention. 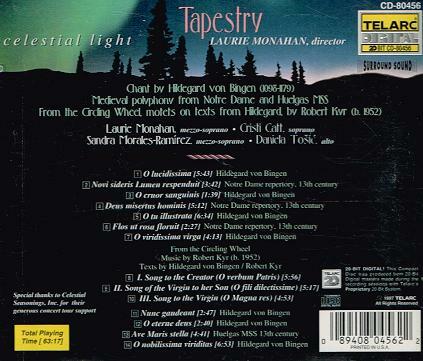 Take a listen to this CD, which is based on her "Symphony of the Harmony of Celestial Revelation" and there can be no doubt. Take a listen and you be the judge. The theme of this music is light and the sound is sheer beauty. The music is vocalized by a group of women called "Tapestry" and they weave magic with their voices. The harmonizing and solo performances are extraordinary and inspirational. Upon listening you wil forget that you are listening to four voices, the music makes you forget all as the "light' fills your mind and you transcend worldly distractions. The fact that you are listening to voices only is astounding alone because the voice captures your attention and has you so focused that you do not notice the absence of musical accompaniment. Our modern ears are used to hearing musical accompaniment with vocals so it is very refreshing to hear this musical bliss. This is medieval chant that is performed with ecstatic intensity. 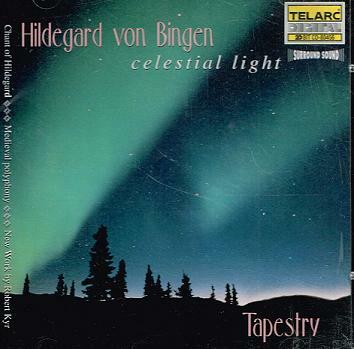 Like much of the medieval music that uses unmeasured chants, Hildegard's music displays unique and wonderful expressions of pacing and expression. 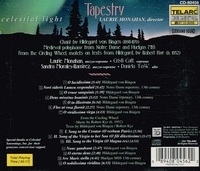 A special cycle of motets are written for 'Tapestry' to perform on this CD entitled 'Circling Wheel' with text by Hildegard, in Latin as she never set them to music. The hour long medieval experience is unique and an experience that is quite heavenly. As intended, "Celestial Light" fills you with light. File this under otherworldly and inspirational, music that is good for your soul."